Proteins are the polymers of amino acids. Amino acids are joined together by a special type of covalent bond (peptide bond) to form linear structures called polypeptides. The polypeptides are then folded into specific structures to form the functional conformation of the protein. The folding of proteins into specific shapes and conformations are assisted and stabilized by many types of bonds in them. Some of these bonds are strong bonds whereas others are weak interactions. Important types of bonds involved in protein structure and conformation are Peptide bonds, Ionic bonds, Disulfide bonds, Hydrogen bonds and Hydrophobic Interactions. The current post describes the importance of each of these bonds and their role in the functional conformation of the protein. What are the different types of bonds present in a protein? 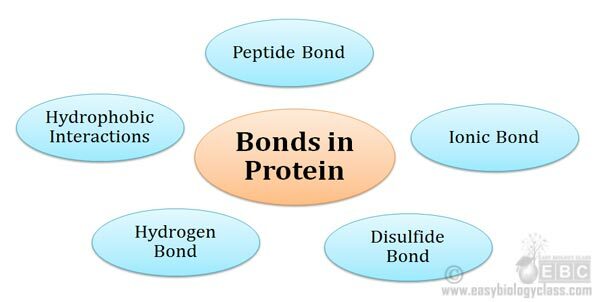 Ø Typically, proteins possess the following FIVE types of bonds. 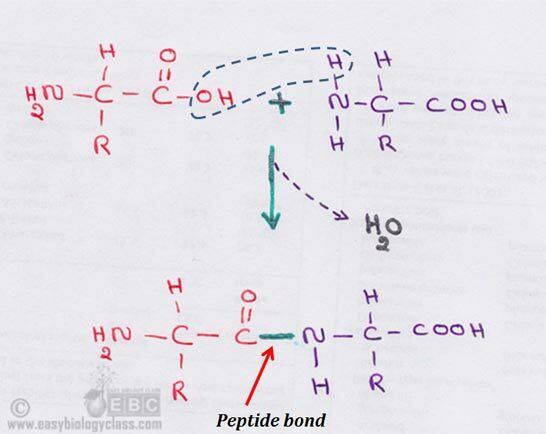 Ø Peptide bond definition: a covalent bond formed between the carboxylic group of one amino acid and the amino group of another amino acid. Ø Peptide bond is a strong covalent bond with high bond dissociation energy. Ø It is formed by the joining of two amino acid residues during protein synthesis. Ø The carboxylic group (- COOH) of one amino acid combine with the amino group (-NH2) of another amino acid to form the peptide bond. Ø Peptide bond formation is an example for a condensation or elimination reaction. Ø One molecule of water is eliminated during the formation of peptide bond by the condensation reaction of two amino acids. Ø The resulting compound after the peptide bond formation is called a dipeptide. Ø A dipeptide has a free amino group at one end and a carboxylic group at the other end. Ø The free amino group or carboxyl group of a dipeptide can form another peptide bond with a third amino acid and so on. Ø Many amino acids join together in this manner to form a polypeptide. Ø Peptide bond formation is facilitated by the enzyme Peptidyl transferase during the translation process of protein synthesis. Ø Peptidyl transferase enzyme is a ribozyme; it is a part of the ribosomal RNA (rRNA) of large subunit of ribosome. Ø In prokaryotes the 23S rRNA and in eukaryotes the 28S rRNA acts as the Peptidyl transferase enzyme. Ø The primary structure of the protein is stabilized by peptide bonds. Ø Ionic bond definition: a chemical bond formed between two ions of opposite charges. Ø In proteins, the ionic bonds are formed between the ionized acidic or basic groups of amino acids. Ø The R groups (side chain) of certain amino acids contain additional acidic (-COO–) or basic (-NH3+) groups. Ø These R groups can ionize to produce charged groups at certain pH. Ø Acidic R groups will be negatively charged since they release the H+ ions. Ø Basic R groups will be positively charged since they accept the H+ ions from the medium. Ø After the ionization of side chain as mentioned above, the amino acids in the protein chain can attract or repel each other based on their charges. Ø The attraction of oppositely charged R groups results in the formation of ionic bonds. Ø Ionic bonds are weak bonds and they are very fragile in an aqueous medium. Ø Even a change in the pH may breakdown the ionic bonds. Ø This is the reason for the denaturation of proteins in the acidic or basic medium. Ø Tertiary and quaternary structures of proteins are stabilized by ionic bonds. Ø Disulfide bond: a covalent bond formed from two thiol groups of two cysteine residues in a protein. Ø The cysteine (Cys or C, a sulfur containing amino acid) contain a highly reactive sulfhydryl group (-SH) in its side chain (R group). Ø The sulfhydryl is highly polar and highly reactive. Ø If two molecules of a cysteine line up alongside each other, the neighboring sulfhydryl groups can be oxidized. Ø This reaction results in the formation of a permanent covalent connection between two cysteine residues called disulfide bond. Ø Disulfide bond in protein chemistry is better known as the disulfide bridge or S-S bond. Ø Disulfide bond is a covalent bond. Ø They are very strong bonds and are not easy to break. Ø A disulfide bond may be formed between the cysteine residues of same polypeptide chain or different polypeptide chain of a functional protein. Ø Disulfide bonds stabilize the tertiary structures of the protein. Ø Hydrogen bond definition: Hydrogen bond is an electrostatic attraction between a hydrogen atom, which is covalently bound to a high electronegative atom (such as Oxygen and Nitrogen), to another electronegative atom of same or different molecules of their close vicinity. Learn more: How hydrogen bond is formed in Water? Ø Hydrogen present in the –OH group or –NH2 of amino acids become slightly electropositive. Ø This is due to the high electronegativity of O and N when compared to hydrogen. Ø Due to the high electronegativity, Oxygen and Nitrogen attract the shared electron of hydrogen more towards them. Ø Thus hydrogen attached to these high electronegative atoms will get a partial positive charge called δ positive whereas the electronegative atoms will get a partial negative charge called δ negative. Ø Consequently, the slightly positive H is then attracted towards the neighboring electronegative oxygen of -C=O or nitrogen atom of -NH2 group. Ø These -C=O and NH2 groups occur along the length of the polypeptide chain in regular sequence. Ø Thus the formation of hydrogen bonds gives a regular shape to the polypeptide chain such as alpha helix and beta plates. Ø Hydrogen bonds are very weak bonds. Ø Occurrence of hydrogen bonds in high frequency makes a considerable contribution towards the molecular stability of proteins. Ø Hydrogen bonds are involved in stabilizing the secondary, tertiary and quaternary structures of proteins. Ø Some R groups in the amino acids are non-polar. Ø The non-polar R groups are hydrophobic and they try to stay away from water. Ø In a long polypeptide chain, there may be many such non-polar amino acids which may be adjacent to each other or separated by polar R groups. Ø In an aqueous environment (inside the cell) the linear polypeptide will fold into such a shape that the hydrophobic amino acids come in close contact with each other and they try to exclude the water due to its hydrophobicity. Ø By this method, the peptide chain of a globular protein will fold into a spherical shape in the aqueous environment. Ø In a folded protein the hydrophobic groups tend to orient towards the inner side of the protein. Ø The hydrophilic residues will form a shell over the hydrophobic moieties. Ø The hydrophilic shell makes the protein soluble in the aqueous environment. Ø Similarly, in the unit membrane, the orientations of membrane proteins are also affected by the hydrophilic and hydrophobic interactions. Posted in Biochemistry, Lecture Notes, Proteins and tagged Biochemistry, Biochemistry Tutorials, Bonds in Protein, Life Science NET Study Materials, Protein.